Harmony Road Studio: Do you see what I see???? Well the other morning my hubs was looking out our back kitchen door and said come quick hon, I was beginning to roll my eyes because he has pulled fast ones on me before, (I rarely see deer out here and one time he made me go to every window in the house , saying come quick come quick only to start laughing and telling me there was no deer) so this time I really had to think whether I was going to get sucked in. He stayed at the door and said move slow and come quick, hurry hurry. 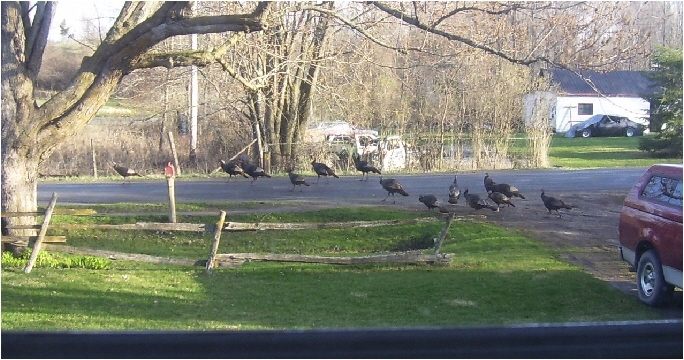 So I get to the back door and look out and coming down the lane way (which leads back to farmer's fields and becomes our driveway) I couldn't believe my eyes, a bunch of wild turkeys, and I mean a bunch. They were huge, the Toms were quite large and as we got to counting there were about 20 in total. They came down the driveway and stopped at the end of the driveway then proceeded to go on the road then back around to the other side of our house and towards the creek. It was quite a site, I am sorry you can't see them very well in this picture, but, if you click you make get a better view. We had to stay quite still and quiet because even when we went to our other kitchen door they stopped and were very cautious. Other than that, not much has been happening. I have been working on making a few gifty items, working on some small 3x3 cards, turning out really cute. I will show them another post. Hope everyone is enjoying spring like weather. We have noticed a change in temperature again and calling for snow tomorrow. Yikes, so, I think tomorrow is going to be an inside day. Til next time, be creative and content. Glad you had some visitors to your yard! They are fun to watch, we get big flocks come through our yard as well. LOL those turkeys are my favorite birds...we had that happen here in our street one autumn too! Love their beautiful feathers!! !